How to uninstall AVS4YOU programs? Sometimes you might need to uninstall the AVS4YOU programs. For example, it's recommended to uninstall a program before updating it to prevent a possible version conflict. Open the Start menu in the lower left corner of your desktop. Select the All Programs menu item, then follow: AVS4YOU >> Uninstall. Note: After upgrading to Windows 8, the Uninstall tile may not be represented on the new Start screen. To access it, please right-click on any blank area of the screen, then click the All apps button in the lower right-hand corner of the screen. All the programs installed on your PC will be displayed on the Apps screen. The Uninstall item can be found in the AVS4YOU section. 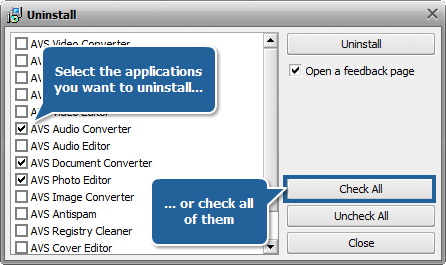 The uninstaller window will open. All the AVS4YOU programs installed on your computer will be listed here. Depending on your aims, you can select several applications separately or check all of them at once clicking the Check All button. Uncheck the Open a feedback page checkbox if you don't want to leave your feedback. 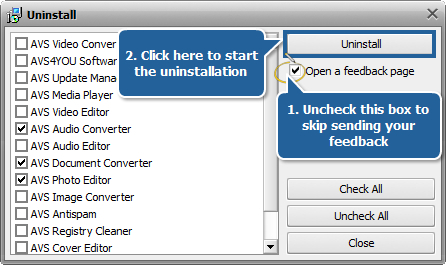 To start the deinstallation process press the Uninstall button in the right upper corner. Wait while the selected applications are being removed from your workstation. If the Open a feedback page checkbox is checked, you will be asked to provide your opinion about the AVS4YOU software. If you are going to reinstall the software, click the link that leads to the Downloads page where the latest versions of the AVS4YOU programs are available. 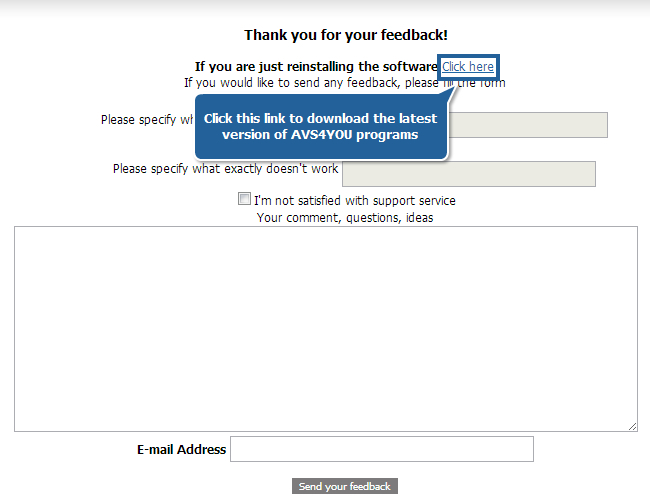 Note: to reinstall the AVS4YOU software, please follow the instructions provided here.